Day three of the Manhattan Bridge detour and the Bowery was blocked from Canal Street to here, just below Rivington where the detour officially ends. This picture could have been taken anywhere, however, as there were multiple locations where not only was the curbside lane obstructed, but the middle travel lane was occupied by a double-parked truck or van. If the NYPD is not going to do its job as an enforcement agency, the DOT should do its job as a design agency. It should offer cyclists something better than the death trap that awaits them as they pour off of the Manhattan Bridge and onto the Bowery. Let the city know this is a problem: call 311 when you see this sort of thing. Report that a vehicle is illegally obstructing a bike lane (yes, it is illegal). It takes time and it’s a hassle but this is supposed to be how the city knows where enforcement is needed, so we might as well make use of the service. I usually bike to Brooklyn every Saturday, but after hearing all these reports of conditions around the bridge, I think I’m going to stop for a few months 😦 And that sad face is just not sad enough to express how that makes me feel. Holly, no need to stop. A)it’s not that bad, and B)you can get to the old dropoff point very easily, even if it means walking your bike across canal if you don’t feel safe. Again, I enjoy your blog generally, but this is a bit over the top. In my opinion, it is more irresponsible of the DOT to put in a protected bike lane on 1st ave without proper signage alerting cars turning left to watch out for cyclists. I don’t know that this is an ideal detour, but I don’t think cyclists should be discouraged from taking it by the shots of double parked cars on Bowery. There are a lot of enforcement problems all over NYC and you should bike on the streets that feel safest to you, but if you expect DOT to assure you that you won’t have some obstacles on your trip, you probably won’t get very far. The fact that 1st Avenue seems dangerous to some doesn’t make the situation on the Bowery any different. Can people not complain about conditions on parts of the West Side Greenway because the East River Greenway is far worse? I don’t expect a smooth, obstacle free ride. Far from it. But I think it’s reasonable for there to be a solution somewhere between perfection and every man for himself. To compare east side and west side is not analogous, those are both designed by DOT. What I am saying is that you can be angry with DOT for an inherent flaw in something they designed (ie, the 1st ave lane) but to be angry with them for lack of enforcement by NYPD is a bit odd. 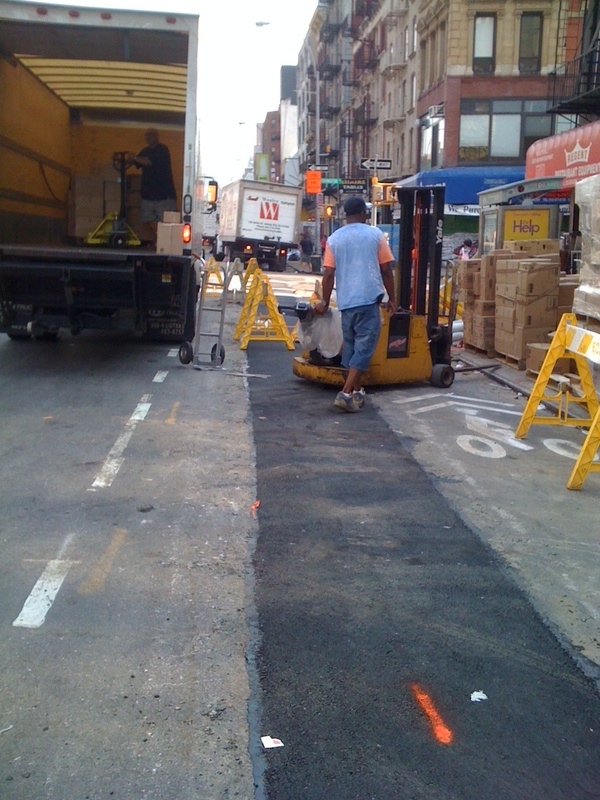 I feel that your beef with them as regards this detour is that it is forcing cyclists on to Bowery. That isn’t exactly true, there are other options. Regardless, it is a bad detour in that the approach in Manhattan is nonexistent. Also, as you hinted at on Twitter tonight, why are we being rerouted? Plenty of exception to be taken with DOT,but a few obstructions on a road that no one is forcing us on doesn’t really do to explain the situation. We (cyclists) used to be on the south side and can do so for a temporary time again, if a truly dangerous situation is created by this detour, it needs to be documented by something other than bike lane obstacles on the Bowery, and while I am no fan of everything done by DOT, to say that they are telling cyclists to drop dead is a tad hyperbolic. What does it need to be documented by? A dead person? Oh, c’mon. That’s exactly the kind of melodrama I am talking about. As TA likes to say, “we are traffic,” so let’s act like it. The dropoff is a tenth of a mile from the old one, it reflects poorly on us to pitch a fit about that, do drivers and straphangers do the same? Surely we can navigate a tenth of a mile. I agree with William here. The announcement of the bridge detour at first had me wondering if I should go out of my way and cross the Brooklyn Bridge on my way into Manhattan. I read all kinds of misinformation regarding the detour, from having to lug my bike up stairs (the horror) to reports that the pedestrian bridge had a “near-vertical incline” (read this ridiculous article, seriously. http://goo.gl/2H7Ki). It really isn’t that big of a deal. If you bike in this city, I’m sure you’re well aware that bike lanes aren’t force fields that surround you and keep you from harm, and that double parked cars, delivery guys, pedestrians and aggressive cab drivers are a part of the deal. Just so you know, Bowery from Canal to Houston is one of the worse, deadliest stretches. It’s amazed that DoT is even doing this reversal. Not only carrying the bikes up and down steps, and having to go all the way south to now access the bike path, now cyclists are asked to contend with the Bowery as well as navigate bridge traffic. All because a few construction workers think its too dangerous with bikes around. Josh, that is simply not true. I am not saying it’s not dangerous, but “deadliest stretches” is not backed up by anything. Saying it don’t make it so. You also don’t need to carry your bike up and down steps. Yeah, I would like to make sure Josh and others know that the changes to the Brooklyn side are really minimal. You don’t have to go “all the way south” to access the bike path, since the streets around the Brooklyn side still offer cyclists the same approach to the bridge. You do not have to carry your bike up or down stairs at all. Everyone should accept that a bridge has to be repaired every once in a while. I think the last time they did a cable overhaul was 50 years ago!